No need for a housewarming gifts when you're still trying to figure out what to do with the stuff you already own. But Mom did receive a thoughtful "parting" gift when she was packing up the last of the boxes last week. 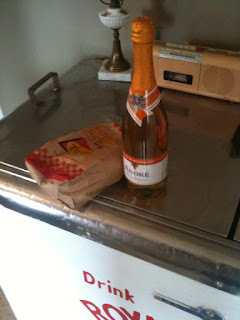 Lil' Miss Bibb dropped off a sack of Macon's finest with a bottle of the un-refinest -- Nu-Way wieners and a bottle of Andre in honor of the infamous Monthlies' Wiener Roast and Cheap Champagne Toast of 2009 that was held at our former home. You know you're from Macon when you and Nu-way have gone a long way together. Thanks, Lil' Miss Bibb, for the cheap and greasy gift with a whole lot of sentimental value. Candy Lou loves you!